It pays to make metric more a part of your life. Realize it or not, like it or not, the world has gone metric. Born in 1600s and 1700s Europe, the metric system has grown to be the prevailing measurement system. It is the official system in all countries except Myanmar, Liberia and the US. Though we have been slow to adopt the metric system here in the US overall, US branded automobiles are almost completely metric worldwide now. Many Amateur Radio operators encounter the metric system via hardware. Metric screws are everywhere in imported ham equipment and consumer items. Many hobby items also come equipped with metric fasteners and have indeed been designed as a metric based product. That 39 inch wingspan model airplane was certainly designed as a 1 meter wingspan at the factory. Loss of an important fastener while servicing or modifying these items means a trip to the hardware store or hobby shop for a replacement if there is no supply on hand. Yet much of the general US population has either ignored or even shunned the metric system for lack of understanding the basics. I once knew an avid model airplane hobbyist who, upon receiving a new airplane kit, would go through the entire fastener inventory bag and immediately replace all metric sized hardware with English sized screws for no better reason than not wanting to deal with the unfamiliar size designations. I’ll get you started on the road to learning the metric system in a way that will help you become comfortable with the standards. Read through this article and you will be well on your way to becoming “metrified” and less dependent on conversion factors. You may already own some means to measure length in metric. If not, pick up a standard 12 inch plastic ruler on the next visit to a stationery or school supplies store. It will likely have an English side and a metric side. 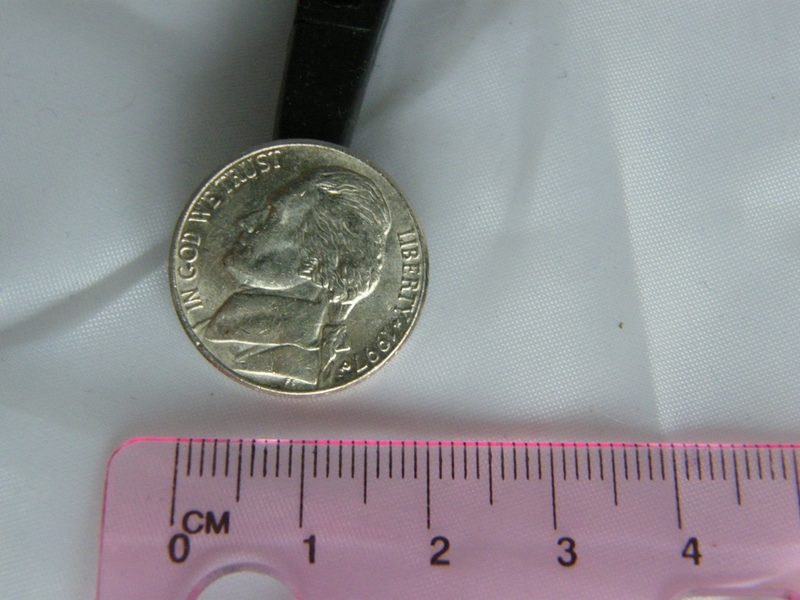 The metric side is marked in millimeters (mm) with each mm about the thickness of a large paper clip and centimeters (cm) about the diameter of a nickel (see Figure 1). There are 1000 mm (milli = 0.001) or 100 cm (centi = 0.01) in 1 meter (m). A meter is approximately 39.4 inches. Make some simple measurements of any objects around you. 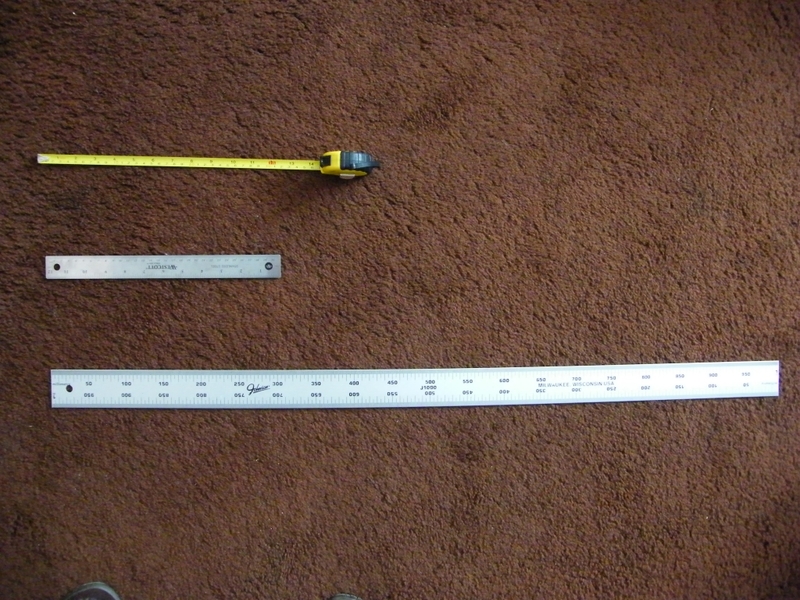 You can even just look at the ruler before you start and notice that the 12 inch ruler is not only 12 inches, but also ~ 300 mm or ~ 30 cm in length. Notice the lack of different units in metric such as exists in the English system where one must constantly jump around inches, feet and yards. In metric length measurements everything is based upon the meter, and all that is needed to make units more convenient is to move the decimal point or change the prefix. You might imagine a project where you would need to find the center of a particular piece of leftover material in order to drill a hole. The work piece might measure a certain number of feet, inches and fractional inches, thus necessitating a conversion of the different units to consolidate into something that can be worked with a calculator. Plus, the fractional element of that measure needs to be converted into decimal format (that is, 7/8 inch needs to be converted to 0.875 inch) in order to perform the calculation. Now imagine that same work piece measured in cm or mm. You would be able to directly divide that metric measure in cm by 2 to achieve the same goal of finding the center point on that piece. I’ve always found it useful to know a few of my body dimensions as well those of a few other common objects to enable approximate measurements when I don’t have anything else with me. I start with my hands. From middle finger tip to thumb tip when fully spread, I’m approximately 8 inches, which is also 20 cm. Most of my fingers are about 3 inches or about 7.5 cm long, or about 1 inch or 2.5 cm per knuckle. Some of my fingernails are about 1 cm wide. I use these “measures” frequently for approximations when looking at potential projects or tasks. Unlike the English system (where you need to constantly jump between units of inches, feet, yards, etc), one only needs to change a prefix to represent the units of 10 and move a decimal point in order to deal with different size ranges. Using my own height of 175 cm (~ 5 feet 9 inches), one could also express my height as 1750 mm or 1.75 meters. Clearly, 175 cm is the easiest to use and visualize in this example, while 1.75 m is reasonably useful, with 1750 mm the least convenient of all. Use prefixes that make sense. Check some of your measurements and try to remember them both in inches and in cm. Along with your height, left finger tip to right finger tip with the arms spread out is another valuable measure. One more is the length from the elbow to the middle finger tip, which is usually about 18 inches and is the basis for the cubit measure from biblical and other ancient stories. One cubit then is also about 45 cm. Look in your vehicle owners manual and you’ll find the manufacturer’s design specification for the overall dimensions expressed in metric and possibly in English measures as well. My present car is about 5 meters long. Most commercial garage and lot parking spaces are about 2.5 meters wide. Common lumber such as plywood and wall studs are about 2.5 meters long. Get the idea? Start fresh with just visualizing and thinking in metric and you’ll quickly become familiar with some of those measures, making it easier to work with. And as another side note, the numeric designations for the CR series of lithium coin cells is “coded” in metric. The common CR2032 cell, for example, is nominally 20 mm in diameter and 3.2 mm thick. The diameter and thickness are combined and become the numerical designation for that cell. Another handy item that most of us probably own is the tape measure. Take a look at yours. It may be marked only in inches and feet. If it is, take a look in stores for one marked in metric as well (see Figure 2). You may be surprised at how plentiful they are these days. If you can’t find them in the neighborhood hardware stores, then you certainly will in the liquidator and job lot style stores. Purchase one with as much length as you can reasonably use and start measuring in metric. One particularly useful exercise is to go around your property to see where hypothetical resonant half wave dipole wire antennas might fit between suitable supports. Even with no specific plan to install any of those antennas, just start to visualize where they might fit anyway — in metric. You don’t really need the 468/f formula for this approximate measure. A half wave antenna for the 20 meter band is — you got it right — approximately 10 meters long (half of a full wave). So go out and see where there is space to fit a 10 meter long antenna with your metric tape. You can look at the English unit side of the tape after you’ve determined the metric length. You can even verify just how close your measurement is with conversions and antenna formulae for more precise measures, if you want. As to the height of that horizontal dipole, a minimum height of a half wave is usually recommended for DX, so try that measure as well. The idea here is to begin thinking in metric and using metric right from the start without converting. After all, the band designations have already been handed to you in metric to begin with, so just use it to your advantage. You can even measure your property lines and building outlines in metric to become familiar with those sizes as well. Getting back to hardware, let’s look at some specific common sizes in the range most likely to be encountered around the house. In the English system, the most common ones I use range from #2 through 0.250 inch. The #2 screws aren’t the smallest screws, but they are often at the bottom of the usable size range. More common yet are the #4 and #6 sizes. Then there’s #8 and #10 for a little more strength, with 0.250 inch topping out the list and also being the first inch size normally used. Of course, there are many larger sizes, but you won’t need them very often. Now let’s look on the metric side, again in the most common sizes. We’ll start with 2 mm through maybe 6 mm diameter. These diameters are exactly that — the nominal design diameter that can be measured in every case. Notice the absence of ambiguous number sizes. If you have a caliper or micrometer you can measure the diameter of any screw, but only the metric screws will be directly readable as a given size. With number size screws, you must first measure, then refer either to a size chart or a known sample in order to accurately identify a number sized screw. Accurately sized metric flat washers and lock washers are also available, but you can often cheat with English sized washers if needed. And if using metric Allen head cap screws, you’ll, of course, also need a set of metric Allen wrenches. One other difference is that instead of a thread per inch count as with number size and fractional size screws, metric threads are expressed as the distance between threads. Thus an M3.0 × .5 screw will be 3 mm diameter and will measure 0.5 mm between threads. Hardware stores generally carry metric sizes down to about 3 mm while hobby shops of the kind that sell flying model airplanes, RC cars and trucks, and model railroads will be a good source for smaller sizes. As with larger hardware stores, the bigger hobby stores will usually have more selection of screws and nuts. If you own a digital caliper — a very worthwhile purchase by the way, you can measure directly in inches or in metric or even instantly convert between the two with the push of a button. These tools though once rather expensive can be found for well under $50 locally and sometimes even as low as $20 or so at liquidator stores or on the Web. I would avoid the ones that include fractional readouts as this only perpetuates dependency on archaic and cumbersome fractions. Though a tool that you may not have been inclined to purchase before, this is definitely one to consider. Most of them operate on the common #357 button cells easily obtainable in most areas. Have you ever heard or been in a contact with a DX station who spoke of their temperature in degrees Celsius or described their station as being so many kilometers (km) from a well known city? I’ll bet many of you have. Well, just what does 10°C mean, or how far away are they from that city? Starting with temperature, the usual range for the US is from -10 to +35°C. Yes, there are extremes to consider as well as certain locales that experience a wider range, but most of us will fall into that zone. Water freezes at 0 °C and boils at 100 °C. Pain begins around 50 °C. You’ll probably want a decent sweater or light coat around 10 °C, keep your house temperature maintained between 20 and 25 °C and want to dress lightly around 30 °C. Start to get the picture? If not, go to your window and look at the outside thermometer. It’s likely to be marked in both C and F (Fahrenheit). As you experience some of those temperatures, take note of them in metric. How is this important for a ham operator? Well, along with casual contacts, read some of the accounts of DXpeditioners and perhaps look back to any of your portable outdoor operations to see where you were comfort-wise. This will help you to relate to the DX contacts you hear expressing their temperature in degrees C.
Canada converted entirely to metric some decades ago. There you will encounter everything expressed in metric including weather forecasts. You may hear commercial broadcasts from there that include local forecasts in Celcius. It’s actually fun to hear. Speaking of Canada, if you cross the border, you’ll see all distances to other locations expressed in km (1 kilometer = 1000 meters) and all speeds expressed in km/h. The speed equivalent is easy, since nearly all analog speedometers in today’s vehicles are marked both in mi/h and in km/h. Look at yours and you may realize that you never even noticed it. Digital speedometers may have a control to allow English or metric readout. A distance of 100 km is approximately 62 miles and is about an hour away at typical highway speeds. Metric measurement convention nearly completely abandons fractions. Though they are still potentially useful as an arithmetic teaching tool and occasionally as an alternate means to express ratios, practical usefulness of fractions is limited in today’s world. You’ll never see 3/8 of a meter. It will be expressed as 37.5 cm instead. A quarter of a cm is expressed as 2.5 mm and so on. If you’ve been “attached” to fractions, this is actually a bonus since any calculator operation will be in decimal anyway thus saving a step. My goal has been to familiarize you with metric measure, but more importantly to start to help you think in metric terms. Who knows? Maybe someday soon we’ll be ordering 150 gram hamburgers instead of 1/3 pounders. 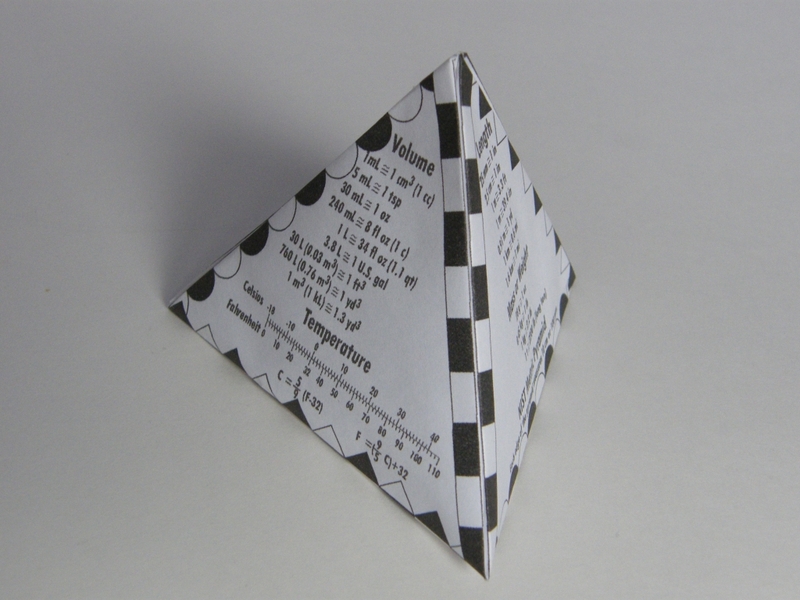 • For a useful fold-up metric desk reference (see Figure 3). • For instant metric/English conversions. Joe Wonoski, N1KHB, an ARRL member, holds an Extra class license. He is an ARRL Connecticut Section Technical Coordinator, ARRL Instructor and ARRL VE. Joe retired from Yale University after 35 years as a research and development support staff member. You can reach Joe at 1121 West Lake Ave, Guilford, CT 06437.